The European Union – often known as the EU – is an economic and political partnership involving 28 European countries. It began after World War Two to foster economic co-operation, with the idea that countries which trade together were more likely to avoid going to war with each other. For the UK to leave the EU it had to invoke Article 50 of the Lisbon Treaty which gives the two sides two years to agree the terms of the split. Theresa May triggered this process on 29 March, 2017, meaning the UK is scheduled to leave at 11pm UK time on Friday, 29 March 2019. It can be extended if all 28 EU members agree, but at the moment all sides are focusing on that date as being the key one, and Theresa May has now put it into British law. The UK and EU have provisionally agreed on the three “divorce” issues of how much the UK owes the EU, what happens to the Northern Ireland border and what happens to UK citizens living elsewhere in the EU and EU citizens living in the UK but talks are now focusing on the detail of how to avoid having a physical Northern Ireland border – and on future relations. To buy more time, the two sides have agreed on a 21-month “transition” period to smooth the way to post-Brexit relations. The UK cabinet has agreed how it sees those future relations working – but this plan, often called the Chequers Plan because it was agreed at the PM’s country residence, has faced criticism from anti-Brexit campaigners and also some leading pro-Brexit Conservatives. And also from the EU – which has said key parts won’t work. 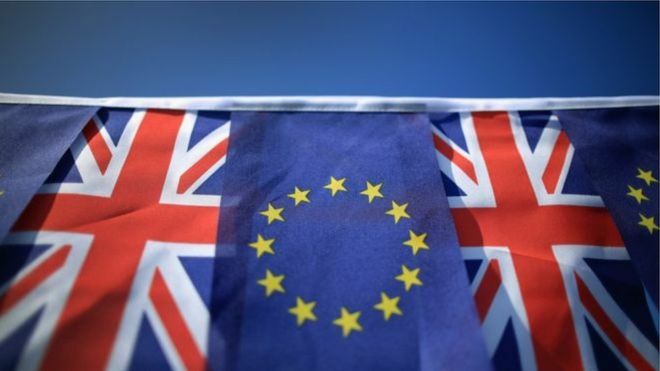 It refers to a period of time after 29 March, 2019, to 31 December, 2020, to get everything in place and allow businesses and others to prepare for the moment when the new post-Brexit rules between the UK and the EU begin. It also allows more time for the details of the new relationship to be fully hammered out. Free movement will continue during the transition period, as the EU wanted. The UK will be able to strike its own trade deals – although they won’t be able to come into force until 1 January 2021. This transition period is currently only due to happen if the UK and the EU agree a Brexit deal. No. Negotiations about future relations between the UK and the EU are taking place now. Both sides hope they can agree by October on the outline of future relations on things like trade, travel and security. If all goes to plan this deal could then be given the go ahead by both sides in time for 29 March 2019. Theresa May delivered a big speech setting out her thoughts on the UK and EU’s future relations on 2 March, 2018 and then followed that up in July with the Chequers Plan, which was the UK’s official view of a proposed Brexit deal. What is the Chequers Plan? Theresa May’s cabinet had a wide variety of views on Brexit – from those who opposed Brexit, to those who led the Leave campaign during the referendum. Getting them all to agree on a vision for the future has been quite a challenge. To do so, Mrs May held an awayday for the cabinet at her country residence – Chequers – in July. At this gathering a favoured UK position for Brexit talks was agreed. It included proposals for the UK to mirror EU rules on goods, plus the UK and EU being treated as a “combined customs territory” which would mean the UK would apply domestic tariffs and trade policies for goods intended for the UK, but charge EU tariffs and their equivalents for goods which will end up heading into the EU. The idea is that this would avoid the need for a visible border with the Republic of Ireland. The plan suggests that the UK would also be free to strike its own trade deals and says it will end free movement of people “giving the UK back control over how many people enter the country”. But a “mobility framework” will be set up to allow UK and EU citizens to travel to each other’s territories, and apply for study and work. A “joint institutional framework” will be established to interpret UK-EU agreements. This would be done in the UK by UK courts, and in the EU by EU courts. But, decisions by UK courts would involve “due regard paid to EU case law in areas where the UK continued to apply a common rulebook”. What has been the reaction to the Chequers Plan? The initial reaction was not positive – Foreign Secretary Boris Johnson and Brexit Secretary David Davis both resigned a couple of days after the plan was agreed at Chequers. And it has not gained much support since then. Both those who oppose Brexit and those who want a clean break with the EU are unhappy with what is seen as a compromise deal. The European Union has also said the trade parts of the proposals are unacceptable. Mrs May has so far stuck by the plan, saying it is a workable one which takes on board both the UK and EU’s red lines, is the best possible one for the UK and EU economies and avoids the need for a visible border on the island of Ireland. What if the UK and the EU do not agree a Brexit deal? Following the European Council President Donald Tusk’s rejection of the Chequers plan after the EU’s September gathering, there has been mounting speculation that the UK could leave the EU without a deal. One of Mrs May’s repeated phrases has been that “no deal is better than a bad deal”. A wide-range of documents setting out the probable state of play if the UK leaves the EU without a deal has been recently published by the government. Labour leader Jeremy Corbyn says it will be a “national disaster” if the UK leaves without a deal, but a group of Tory MPs have endorsed a plan for a “clean break” with the EU. What changed in government after the referendum? Theresa May surprised almost everyone after the 2017 Easter Bank Holiday by calling an election for 8 June (it had not been due until 2020). She said she wanted to strengthen her hand in Brexit negotiations with European leaders. She said Labour, the SNP and other opposition parties – and members of the House of Lords – would try to block and frustrate her strategy. However Mrs May did not increase her party’s seats in the Commons and she ended up weakened, having to rely on support from the 10 MPs from Northern Ireland’s Democratic Unionist Party. David Cameron, his Chancellor George Osborne and many other senior figures who wanted to stay in the EU predicted an immediate economic crisis if the UK voted to leave and it is true that the pound slumped the day after the referendum – and is currently about 10% down against the dollar, while remaining 15% down against the euro. Predictions of immediate doom were wrong, with the UK economy estimated to have grown 1.8% in 2016, second only to Germany’s 1.9% among the world’s G7 leading industrialised nations. The UK economy continued to grow at almost the same rate in 2017 although there was slower growth, of 0.6% in the first half of 2018. Inflation rose after June 2016 but has since eased to stand at 2.7%. Unemployment has continued to fall, to stand at a 43-year year low of 4%. Annual house price increases have steadily fallen from 9.4% in June 2016 to 3% in the year to June 2018, according to official ONS figures. This is the lowest annual increase in prices for five years, but it is still higher than inflation so property continues to show “real terms” increases in prices. They officially started a year after the referendum, on 19 June, 2017. The UK and EU negotiating teams met face-to-face for one week each month, with a few extra sessions also thrown in ahead of EU summits. Their first tasks were trying to get an agreement on the rights of UK and EU expat citizens after Brexit, reaching a figure for the amount of money the UK will need to pay on leaving, the so-called “divorce bill”, and what happens to the Northern Ireland border. A provisional deal on these issues was reached on 8 December: ‘Breakthrough’ deal in Brexit talks. They then agreed terms for the “transition” phase and now have moved on to the permanent post-Brexit relationship, while trying to agree on the precise wording of the divorce issues. The Conservative government introduced the European Union (Withdrawal) Bill to Parliament to end the primacy of EU law in the UK on Brexit Day. This “Great Repeal Bill”, as it was originally called, incorporates all EU legislation into UK law in one lump, after which the government will decide over a period of time which parts to keep, change or remove. The bill was subject to fierce debate as it passed through Parliament, with a number of attempts to change its wording. It finally became law in June 2018. Labour says it accepts the referendum result and that Brexit is going to happen. Leader Jeremy Corbyn says he would negotiate a permanent customs union with the EU after Brexit, which would be very similar to the one it has now. This is the only way to keep trade flowing freely and protect jobs, he says, as well as ensuring there is no return to a “hard border” in Northern Ireland. He has ruled out staying a member of the single market, as some of his pro-EU MPs want, so he can carry out his plans to nationalise key industries without being hampered by EU competition rules. He says the UK should have a very close relationship with the single market. Labour accepts that some form of free movement of people might have to continue. He also insists he could persuade Brussels to let the UK have a say in its rules post-Brexit. Theresa May set up a government department, headed by veteran Conservative MP and Leave campaigner David Davis, to take responsibility for Brexit talks. Former defence secretary, Liam Fox, who also campaigned to leave the EU, was given the new job of international trade secretary and Boris Johnson, who was a leader of the official Leave campaign, is foreign secretary. These three were each playing roles in negotiations with the EU. However that has all changed now, with Boris Johnson and David Davis resigning over Theresa May’s preferred Brexit plan. Dominic Raab is the new Brexit secretary and Jeremy Hunt is foreign secretary. But Mrs May has made clear that she is in charge of the negotiations. The UK could cut all ties, but Theresa May and others would like to avoid such a “cliff-edge” where current regulations on things like cross-border trade and travel between the UK and the EU ends overnight. They think it would harm the economy. There are also questions about what would happen to Britain’s position as a global financial centre and the land border between the UK and the Republic of Ireland. There is also concern that Brits living abroad in the EU could lose residency rights and access to free emergency health care. Healthcare rights will continue as now although it is not clear yet what status an EHIC card would have for other travellers after Brexit. As with all other aspects of Brexit, this agreement would only come into force if and when the UK and the EU agree on an overall Brexit deal. UK government ministers say there will be an online system – similar to one used to renew driving licences – that will take minutes to complete with a fee similar to getting a passport, which is about £72. We don’t yet know what it would mean for recent arrivals, but it’s worth saying that even if no Brexit deal was done, EU nationals with a right to permanent residence, which is granted after they have lived in the UK for five years, should not see their rights affected after Brexit. With rising talk of a no deal Brexit, Mrs May has said EU citizens in the UK will be able to stay even if there is no deal done on Brexit. A fall in the pound means exports get a boost as UK goods will be cheaper to buy in other countries, but some imported goods could get more expensive. The latest UK inflation figures have the rate at 2.7%, above the target level, but not out of kilter with recent years. The rate of increase in the size of Britain’s population has slowed since the Brexit vote. Annual net migration is estimated to have fallen by nearly a third from the time of the referendum to 244,000 in the year to September 2017. “Brexit could well be a factor in people’s decision to move to or from the UK, but people’s decision to migrate is complicated and can be influenced by lots of different reasons,” the Office for National Statistics said. Will MPs get a vote on the final Brexit deal? Yes. Theresa May has promised there will be a Commons and Lords vote to approve whatever deal the UK and the rest of the EU agree at the end of the two year process. This vote was proposed as a “take it or leave it” one, after the deal was done. But Mrs May suffered her first defeat as PM in December 2017 when enough Tory rebels joined with opposition parties to back an amendment to the EU Withdrawal Bill which puts into law the fact that any Brexit deal can only become law if MPs have voted for it. So could MPs block Brexit? In theory, yes, but the EU side would need to agree too. The referendum result is not legally binding and the withdrawal agreement also has to be ratified by Parliament. But the UK has triggered the automatic process of leaving the EU. MPs could vote against the exit deal between the UK and EU. This would mean the UK would be on track to leave without a deal, rather than halting the process. Some anti-Brexit MPs believe that if that happens, they could then persuade enough of their colleagues to back a second referendum. Scotland’s First Minister Nicola Sturgeon said in the wake of the Leave result that it was “democratically unacceptable” that Scotland faced being taken out of the EU when it voted to Remain. Ms Sturgeon has officially asked for permission for a second referendum to be held. She had wanted the vote to be held between the autumn of 2018 and spring 2019, but after losing seats at the 2017 general election she has put her plans on hold with no referendum likely until 2021. Theresa May has said a second referendum should not be held during the Brexit process. The land border between Northern Ireland and EU member the Republic of Ireland has been a key part of the Brexit talks. There is currently a common travel area between the UK and the Republic. Like Scotland, Northern Ireland voted to remain in the EU in the 2016 referendum. The result in Northern Ireland was 56% for Remain and 44% for Leave. Both sides in the Brexit talks agree that they do not want a return to a “hard border” – that means no physical infrastructure, such as customs posts or a network of surveillance cameras. But the wording to agree on this proved tricky and there are still many questions to be answered about how it would work in practice. It remains a stumbling block in Brexit talks. The draft UK-EU agreement in December 2017 said that the UK “will maintain full alignment with those rules of the Internal Market and the Customs Union which, now or in the future, support North-South cooperation, the all island economy and the protection of the 1998 Agreement’. The EU has translated this into a draft legal document, setting out its interpretation of what was agreed. The document proposes a “common regulatory area” after Brexit on the island of Ireland – in effect keeping Northern Ireland in an EU customs union – if no other solution is found. Mrs May says this would threaten the “constitutional integrity” of the United Kingdom and lead to a border in the middle of the Irish sea, something no British prime minister could ever accept. The UK has proposed its own temporary “backstop” arrangement if a new customs system is not ready in time by the end of the transition period. There was an early post-referendum cut in interest rates, which has helped keep mortgage and other borrowing rates low. The reasonably strong performance of the UK economy, and the increase in inflation led to the Bank of England raising interest rates from 0.25% to 0.5% in November 2017 – the first increase in interest rates for 10 years. Interest rates going up generally makes it more expensive to pay back a mortgage or loan – but should be good news for savers as they should get amore interest on their money. Britain Stronger in Europe – the main cross-party group campaigning for Britain to remain in the EU was headed by former Marks and Spencer chairman Lord Rose. It was backed by key figures from the Conservative Party, including Prime Minister David Cameron and Chancellor George Osborne, most Labour MPs, including party leader Jeremy Corbyn and Alan Johnson, who ran the Labour In for Britain campaign, the Lib Dems, Plaid Cymru, the Alliance party and the SDLP in Northern Ireland, and the Green Party. Who funded the campaign: Britain Stronger in Europe raised £12.1m, including two donations totalling £2.3m from the supermarket magnate and Labour peer Lord Sainsbury. Other prominent Remain donors included hedge fund manager David Harding (£750,000), businessman and Travelex founder Lloyd Dorfman (£500,000) and the Tower Limited Partnership (£500,000). Who else campaigned to remain: The SNP ran its own remain campaign in Scotland as it did not want to share a platform with the Conservatives. Several smaller groups also registered to campaign. Vote Leave – A cross-party campaign that had the backing of senior Conservatives such as Michael Gove and Boris Johnson plus a handful of Labour MPs, including Gisela Stuart and Graham Stringer, and UKIP’s Douglas Carswell and Suzanne Evans, and the DUP in Northern Ireland. Former Tory chancellor Lord Lawson and SDP founder Lord Owen were also involved. It had a string of affiliated groups such as Farmers for Britain, Muslims for Britain and Out and Proud, a gay anti-EU group, aimed at building support in different communities. Who funded the campaign: Vote Leave raised £9.8m. Among its supporters was businessman Patrick Barbour, who gave £500,000. Former Conservative Party treasurer Peter Cruddas gave a £350,000 donation and construction mogul Terence Adams handed over £300,000. Who else campaigned to leave: UKIP leader Nigel Farage was not part of Vote Leave. His party ran its own campaign and was involved in Leave.EU, a campaign run by former UKIP donor Arron Banks, which raised a total of £3.2m. The Trade Union and Socialist Coalition also ran its own out campaign. Several smaller groups also registered to campaign. The National Audit Office, using a different formula which takes into account EU money paid directly to private sector companies and universities to fund research, and measured over the EU’s financial year, shows the UK’s net contribution for 2014 was £5.7bn. As already mentioned the plan is for all EU laws to be transferred into UK law as part of the EU (withdrawal) Bill. That means the government then has time to decide what laws to keep, scrap or change without the risk of a legal black hole on the first day after Brexit. The European Commission says that pet passports will, like everything else, form part of the negotiations. The Department for Environment, Food and Rural Affairs said: “The UK has a long history of world-leading animal welfare and biosecurity standards, which we are committed to safeguarding and improving, securing the best deal for Britain as we leave the EU. But many on the left, including Labour leader Jeremy Corbyn, feared it wouldl shift more power to multinational corporations, undermine public services, wreck food standards and threaten basic rights. This became an issue in the referendum debate after the Leave campaign claimed the money Britain sends to the EU, which it claimed was £350m a week, could be spent on the NHS instead. They are hoping to strike a broad agreement on trading terms by March 2019 but the finer details could take years to sort out. The UK will also need to reach agreements with other nations around the world. Veronique, who lives in Italy asked this one. After Brexit, there will be two possibilities.